The cast iron pan above is one that has been in my family for four generations. My grandmother came to America from the Russian Ukraine about 100 years ago. After passing through Ellis Island, my grandmother’s family, including her mother and several siblings, settled in the Weequahic section of Newark, New Jersey. If you’ve ever read any of Philip Roth’s short stories or novels, such as Goodbye, Columbus or American Pastoral, many of them are set in this part of Newark. After my grandmother got married and had kids, she lived in a two family house, with my great grandmother living in the upstairs half. My mother recently told me that her grandmother and her mother shared a tea kettle and “the shvartze skovoroda,” the black cast iron pan pictured above. Shvartze is the Yiddish word for black, and skovoroda is Russian for frying pan. I don’t know what has happened to the tea kettle, but my sister has the shvartze skovoroda. Both were placed on a shelf in the hallway that went between the two homes, and whomever needed it would use it, clean it and put it back. Undoubtedly, many of the meals that were made in it were shared. My mom has especially fond memories of the french fries the shvartze skovoroda produced. After hearing the story of how it was shared by my grandmother and her mother, I proposed that my sister and I share the shvartze skovoroda. Since we don’t live in a two family house, we’ll share it on an annual basis going forward. Hopefully, as our kids set up homes of their own in the future, they’ll maintain what hopefully will become a tradition of sharing the shvartze skovoroda. 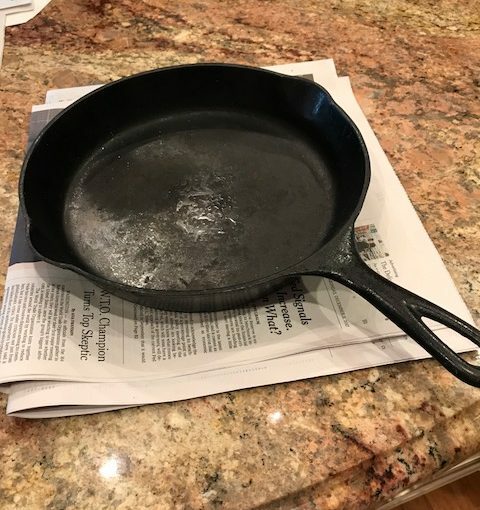 My wife and I use cast iron skillets most of the time. They are relatively inexpensive, easy to clean, and last several lifetimes. I don’t have an InstaPot (yet), but it is hard to imagine that one bought today will still be in service a hundred years from now. Since it is Hannukah for a few more days, I’ll share my mom’s recipe for latkes, the traditional Jewish potato pancake served at this time of year. They are good by themselves, or topped with apple sauce or sour cream. My mom’s apple sauce recipe is included as well.